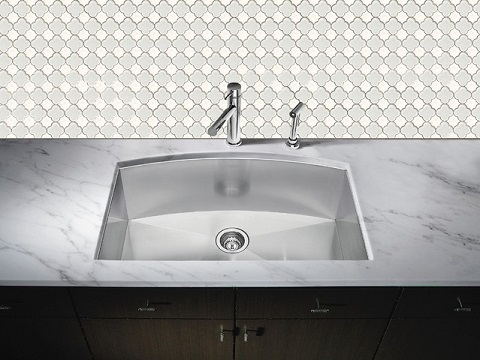 Most tile is simple and squared – not necessarily square, but with all 90 degree angles and perfectly straight lines. 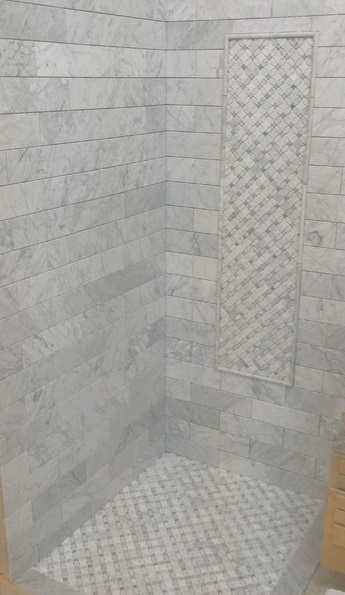 The obvious reason is that rectangular shapes of all sizes fit together well and are straight all along the outside edges when put together, which minimizes the amount of tile that needs to be cut during installation. But while squared tiles are easier to install, shaped tiles are often vastly more interesting to look at. So if you’re interested in adding a tile accent that will really stand out – and you don’t mind a slightly more complicated installation – these less conventional mosaic shapes might be more up your alley. Arabesque titles are one of the more popular patterns right now. Also known as Moroccan tile (and sometimes lumped together with lantern tile), arabesque tiles have a curved diamond shape punctuated with neat symmetrical points at the top and bottom. Designed to be perfectly interlocking, these tiles have a subtle middle eastern flair that makes them immediately stand out. That said, more often than not these tiles are done in fairly muted colors – either pale glazed ceramics, frosty glass, or sometimes metal rather than bold reds, blues, or oranges – which means they work well with a contemporary bathroom space. Technically, arabesque tiles are a type of lantern tile, but lantern tiles come in a much wider variety of sizes and shapes. These, too, are streamlined diamond shapes, with points at the top and bottom and curved sides, but they don’t necessarily have the distinctive points characteristic of arabesque tile, and they range from long and lean (like tall vases) to short and very round (like fat teardrops. Where arabesque tile has a very distinctly exotic look, curvier and more simplified lantern tiles are a bit subtler, but still shapely and eye-catching. 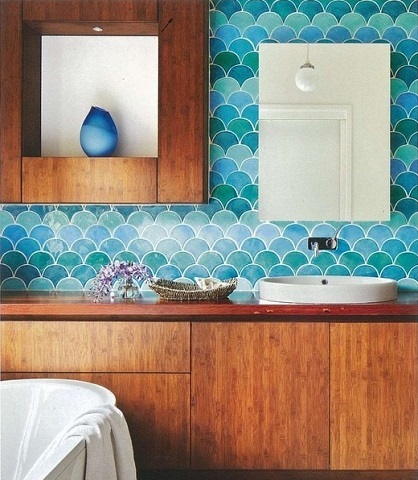 Another bold, distinctive type of tile that’s starting to become more popular is fish scale patterned tile. Also sometimes called fan tile, these odd-shaped tile have a large curved top sitting on top of a concave triangle, designed so that when they interlock, they appear to be layered like the scales of a fish. This is actually a pretty great optical illusion – at a glance, it’s easy not to notice the unusual shape of the tile, because the eye sees the tile as layered rather than interlocking. The final effect is quite beautiful and striking – and way, way out of the ordinary. So far all the tile shapes I’ve mentioned have been designed for single-tile layouts, but some of the more unique and unusual mosaic designs are actually interlocking patterns made of several different tile shapes, more like a traditional mosaic. This flower patterned tile is a great example; it’s composed of four small ovals fanned out around a tiny circle, with a concave diamond to hold each “flower” together. This pattern is most often done in white marble, and is used to create texture and visual interest in a white-on-white design, but if the “petals” are done in a different color, the pattern changes from looking like a flower to looking like repeating circles with a diamond in the middle. 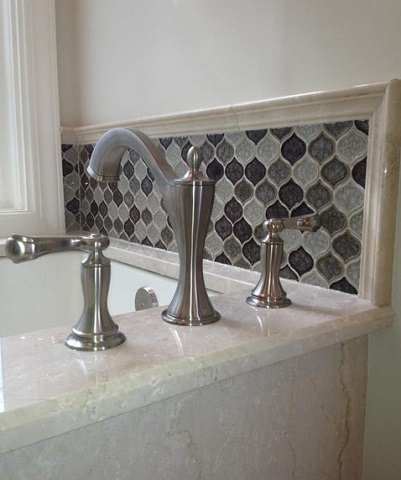 Because these patterned mosaics are often sold in easy-to-install sheets, even the most detailed designs are roughly equivalent to much simpler patterns with larger tile, but the still will need to be trimmed around the outside edges of the backsplash, accent, or floor. As a rule of thumb, the more different types of tile you use, the more complex and intricate the pattern will be – and often the smaller the tile, which means they run the risk of looking and feeling a little bit busy. Two tile patterns, though, are generally pretty innocuous – both of the two tile shapes tend to be about the same size, and interlock more subtly (to the point that, at a glance, you might not notice there’s more than one type of tile at all). This modified cross tile is a good example; traditional cross tile is more rectangular and less club shaped, and the “connector” pieces are generally a bit larger, but this simple, curvy design avoids harsh lines and keeps the two tile types about equal sized, which makes the pattern feel nicely balanced. Of course, tile doesn’t have to totally abandon square shapes to be interesting. In fact, there are a lot of ways to take basic rectangular tile and make it shine – though again, these less-standard patterns tend to be a little more complicated to install. 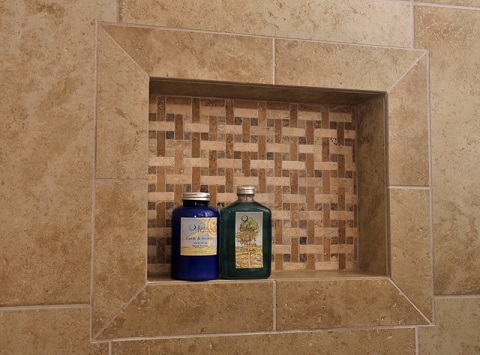 The cooler single-tile patterns all involve re-orienting the tile: like a herringbone or basket weave pattern. Patterns with two or more types of square or rectangular tile, though, can get really interesting – with beautiful radials and pinwheels, and more complex and complicated weave patterns that are vastly more visually interesting than a traditional brick-style rectangular pattern. So don’t let yourself be limited to the same-old traditional rectangular tile designs. Whether or not you’re looking for something square, there’s a world of options out there, and the more unique your design, the more your tile backsplash or accent will stand out. 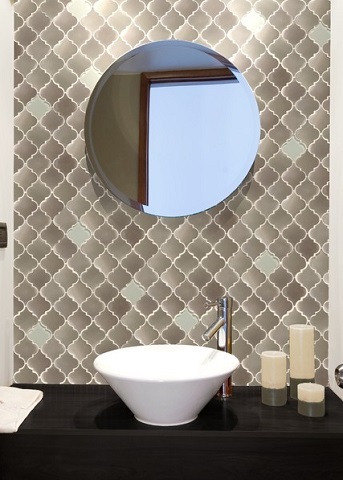 Do you have a favorite mosaic tile pattern on this list? Let me know in the comments below! This entry was posted in Bathroom, Decorating Ideas and Tips, Kitchen, Latest Trends and tagged Bathroom Tile, kitchen tile, mosaic tile, mosaic tile patterns, Tile, tile backsplashes, tile ideas, tile patterns, tile shapes.